You don’t go to Chi for starters and main courses as much as their signature meals-in-a-bowl. Atmospherics: There are three branches, the most crowded being the one in Select City Walk and the most well-appointed being at the Eros Complex, Jangpura. This is just a personal opinion, but I prefer the food at Safdarjung Development Area. 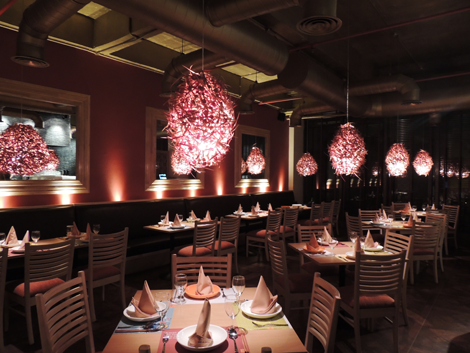 The space at each location is cheerful with their trademark straw lamps and red accents. There’s not a whit of pretentiousness anywhere in Chi, which is why the good dishes stand out as excellent. Service, let it be said, is not their strong suit. Table talk: Khousuey (Rs 475/345 chicken/veg) is representative of the cuisine at Chi. Meats, vegetables, gravy, noodles and seasonings, all in one bowl. Nasi Goreng (Rs 495) may not have a gravy element in it, but in the country of its origin, Indonesia, it is considered a complete meal with a fried egg, two skewers of chicken satay and prawn crackers. You don’t often find the dish cooked with such authenticity in these parts. Rice congee (Rs 325) is the most soul-satisfying dish to come out of any oriental restaurant at that price point. The porridge is exactly what you would find in the street stalls of Hong Kong or Singapore. It is so thick you can barely stir it with your spoon, and in its depths lurk chunks of chicken, pork, fish or vegetables. It is filling, delicious and surprisingly inexpensive. With the accompaniments – soy, fried garlic, spring onion greens, fried onions, roasted peanuts etc – it is a gourmet treat on a budget. Plus and minus: On the plus side, Chi really does go the extra mile in having several different varieties of rice ready, including sticky rice and brown rice. The mixed seafood soup (Rs 195) was a watered down affair that seemed to have been destined to become a sweet corn egg drop but changed its mind at the last minute. Menu engineering, rather than a glitch in the kitchen, meant that thukpa (Rs 350/325/290 prawn/chicken/vegetables) was put under the ‘ramen’ heading, leading me to believe that it would be a nifty mix of Tibetan and Japanese, but no such luck. Chi offers chopsticks only on request because ‘children play with them’!